111 Beacon is located on the south side of Beacon, between Arlington and Berkeley, with 109 Beacon to the east and 113 Beacon to the west. 111 Beacon was built ca. 1863, one of six contiguous houses (101-103-105-107-109-111 Beacon) built at about the same time and in the same style. Click here for an index to the deeds for 111 Beacon. On February 21, 1863, 111 Beacon was purchased from George Upham by textile manufacturer and wholesale dry goods dealer Ebenezer Dale, He and his wife, Caroline Mumford (Young) Dale, made it their home. Their unmarried son, Ebenezer Dale, Jr., a student and later a dry goods merchant, lived with them. They previously had lived at 51 Chestnut. They also maintained a home at Steep Bank in Gloucester. Ebenezer Dale’s younger brother and business partner, Theron J. Dale, lived with them. He previously had lived at 5 Walnut. By 1867, he had moved to 103 Beacon. By 1865, the Dales were joined at 111 Beacon by their son-in-law and daughter, Charles Nesbit Turnbull and Mary Bliss (Dale) Turnbull, and their children, Charles and Caroline Turnbull. Charles Nesbit Turnbull had served in the US Army as a topographical engineer, assigned to the surveys of the Mexican border and the Great Lakes in 1854-1859. He then served as an assistant professor of mathematics at West Point and, during the Civil War, served on General Butler’s staff and later became Chief Engineer of the Eighth Army Corps. After the war, he settled in Boston and became a commission merchant dealing in imported goods. Ebenezer Dale died in December of 1871. After his death, Caroline Dale, Ebenezer Dale, Jr., and the Turnbulls continued to live at 111 Beacon. Charles Nesbit Turnbull died in December of 1874, and Caroline Turnbull died in September of 1880. Ebenezer Dale, Jr., married in November of 1880 to Lydia Jackson Storrow and they moved to 13 Hereford. 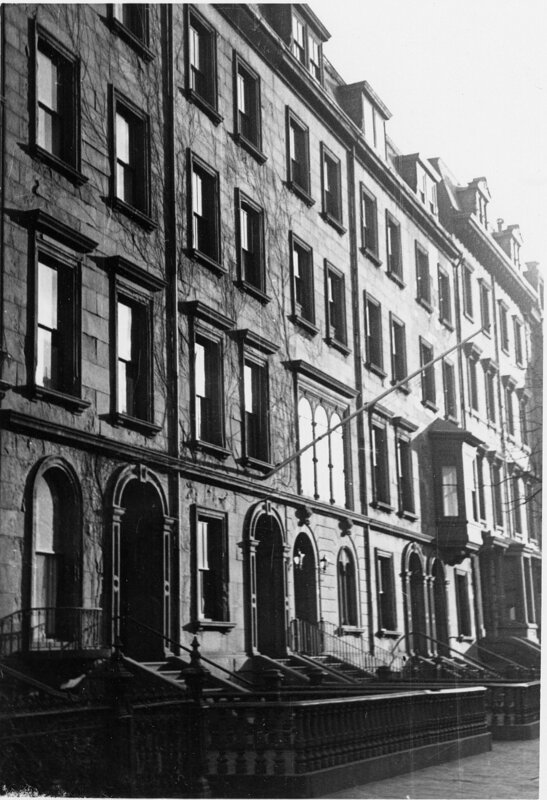 Caroline Dale, Mary (Dale) Turnbull, and Charles Turnbull continued to live at 111 Beacon during the 1888-1889 winter season, but moved thereafter to 16 Louisburg Square. Caroline Dale died in April of 1891. Charles Turnbull married October of 1891 to Maria (May) Peck. After their marriage, they lived at a newly-built four-unit apartment house at 481 Beacon. 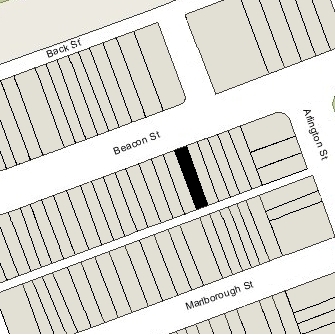 Mary Turnbull moved to the companion apartment house at 479 Beacon. On June 4, 1891, Ebenezer Dale’s estate transferred 111 Beacon to Mary (Dale) Turnbull (her brother, Ebenezer Dale, Jr., had committed suicide in September of 1889 and left no issue). She leased the property to others. By the 1889-1890 winter season, 111 Beacon was the home of Dr. William Sohier Bryant and his wife, Martha Lyman (Cox) Bryant. They had lived at 191 Beacon in 1889. They also maintained a home in Cohasset. He was a physician specializing in the ear. They continued to live at 111 Beacon in May of 1892, when their daughter, Alice, was born, but moved soon thereafter to 1 Charlesgate East. By the 1892-1893 winter season, 111 Beacon was the home of attorney Charles Thorndike and his wife, Mary Edmondson (Edgar) Thorndike. They previously had lived at 101 Beacon. They continued to live at 111 Beacon until 1898, when the moved to a new house they had built at 483 Commonwealth. By the 1898-1899 winter season, 111 Beacon was the home of William Sheafe, Jr., and his wife, Grace Thornton (Dame) Sheafe. William Sheafe was a real estate dealer and lawyer. The Sheafes continued to live there in 1913, but had moved to Gloucester by 1914. The house was not listed in the 1914 and 1915 Blue Books. By the 1915-1916 winter season, 111 Beacon was the home of Donald McKay Frost and his wife, Mary Mitchell (Ryerson) Frost. They previously had lived at 4 Louisburg Square. Donald McKay Frost was an attorney who later became a noted antiquarian and book collector specializing in the history and settlement of western America. By 1920, the Frosts had purchased and moved to 18 Exeter. By the 1919-1920 winter season, 111 Beacon was the home of Stuart Weston Webb and his wife, Marcia (Sewall) Webb. They previously had lived at 13 Louisburg Square. Stuart Webb was a banker and business executive. He was a vice president of the Old Colony Trust Company and, during his career, served as president of Pathé Films, Gorton-Pew Fisheries of Gloucester, and the Eastern Manufacturing Company. The Webbs continued to live at 111 Beacon in 1924, but had moved to Chestnut Hill by 1925. By 1925, 111 Beacon had become one of several buildings on Beacon Street occupied by Erskine School, operated by Miss Euphemia E. McClintock. Euphemia McClintock had served as president of the College for Women in Columbia, South Carolina, until it merged with Chicora College in 1915. She moved to Boston, where her sister, Mary Law McClintock, operated Miss McClintock’s School at 4 Arlington and (by 1922) at 135 Beacon. Euphemia McClintock probably first was a teacher in her sister’s school, but by late 1923 had established her own institution, Erskine School, at 115 Beacon. Mary Law McClintock died in January of 1925, and Euphemia McClintock appears to have inherited her sister’s school. McClintock School soon ceased operation at 4 Arlington and 135 Beacon became Erskine School. At about the same time, Euphemia McClintock ceased leasing 115 Beacon (which became a private home again) and leased 111 Beacon. She purchased the house from Mary Dale on May 1, 1926. By 1927, Erskine School had dormitories and classrooms located at 111, 129, 135, and 179 Beacon. Euphemia McClintock continued to serve as the school’s director and to live at 129 Beacon. On November 28, 1941, Anne M. Young and Franklin W. Fessenden, conservators of the property of Euphemia McClintock, transferred the five buildings she owned — 111 Beacon, 129 Beacon, 135 Beacon, 145 Beacon, and 303 Berkeley (147 Beacon) — to Erskine, Inc.
111 Beacon continued to be a dormitory for Erskine School until about 1950. On September 15, 1950, 111 Beacon was acquired by Joseph Charles Butera. A noted artist, he operated the Butera School of Fine Arts (later the Butera School of Art) at 240 Huntington, which he moved to 111 Beacon after acquiring the building. 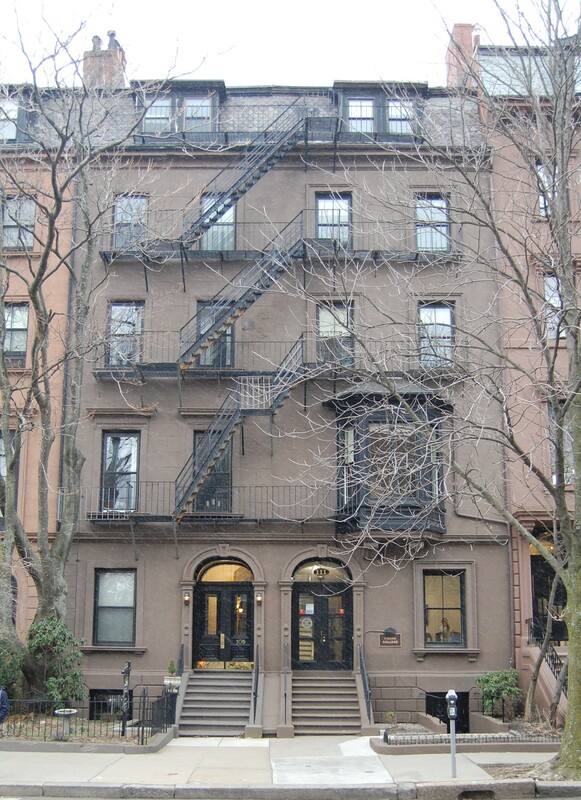 Joseph Butera and his wife, Sylvia (Lyon) Butera, lived in an apartment at 361 Beacon until about 1952, when they moved to live at 111 Beacon. They continued to live there until about 1957. They subsequently lived at 33 West Cedar. Joseph Butera died in November of 1963. Sylvia Butera and her son, Joseph L. Butera, continued to operate the Butera School of Art at 111 Beacon. On January 6, 1984, Joseph L. Butera acquired 111 Beacon from his mother, and on December 9, 1991. he transferred the property to himself as trustee of the Art Educational Trust. He continued to operate the school at 111 Beacon until 2010. On July 28, 2010, Fisher College purchased 111 Beacon from Joseph L. Butera and the Butera School of Art became a part of Fisher College. As of 2015, Fisher College owned 102-104–106–108–110–112–114–116–118 Beacon, 111 Beacon, 115 Beacon, 131–133 Beacon, 139–141 Beacon, 1 Arlington, and 10-11 Arlington.